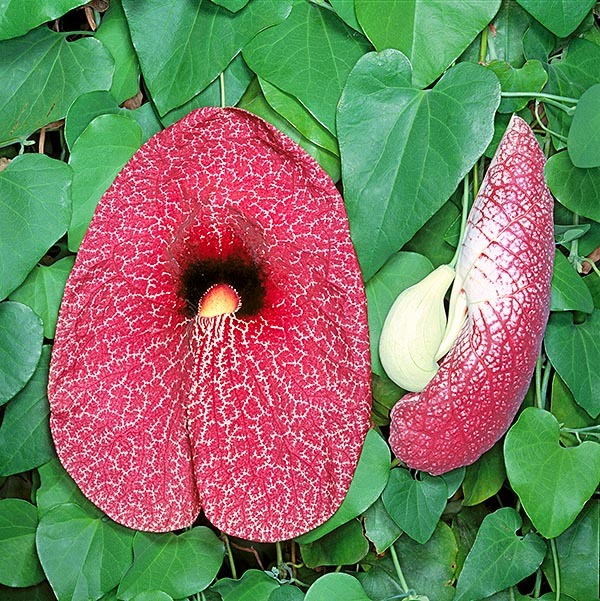 The plants belonging to this family live in the tropical zones and in the holoarctic temperate region, where they are present from the sea level, like the Aristolochia littoralis, up to about the 1.000 m of altitude, like the [Aristolochia leuconeura. The perennial climbing herbaceous species with woody main stems do prevail, but also other not climbing forms can be met, as in the case of the genera Asarum and Saruma. The flowers are usually merged in rhipidiums (cymose inflorescences with flowers alternating on the two sides), but may be also solitary. Being trimerous, that is with 3 floral parts per verticil (the whole of the elements that get out on the same level from a point of the flower) this family has been considered as “the link between monocotyledons (3 petals or multiple of three) and dicotyledons (4-5 petals or their multiples)”, with petals typically merged, excepting one Asian species, the Saruma henryi, only member of this genus, which has also a dichlamydeous perianth (with 2 verticils) instead of the monochlamydeous perianth (with only one verticil) typical of the family. Usually zygomorphic corollas (with bilateral symmetry), very showy due to their structure like a shape of trumpet or lamp, at times similar to a mushroom, of brown or reddish colour, but at times also yellow, like the inside of the Aristolochia sempervirens that arouses the attention of the pollinators.However, what most attracts the pollinators is the smell. Malodorous secretions of the flowers, often oily and slippy, much appreciated by the dipterans, to whom is entrusted the pollen transfer. The fruits of these plants are usually berries, plurifollicular (dry fruits derived from one or more flowers that contain various seeds and open along the line of suture of the carpel), capsules or schizocarps (dry fruits formed by various merged achenes each one deriving from a carpel and may contain one or more seeds), at times dehiscent, that free oily seeds with endosperm having no starch. The leaves, devoid of stipules, are usually alternate with entire margin, but may be also palmate-lobed or lobulate, pedunculated and often cordate. They are much known plants for their medicinal properties coming from the contents in alkaloids and flavonols, even if till now it has not yet been possible to show the action mechanism. The species of the genus Aristolochia, for instance, are administered to the pregnant women and that are breastfeeding or are considered as an antidote against the poison of scorpions and snakes, but may cause kidney damages, because the aristolochic acid is a powerful nephrotoxic and carcinogenic. The genus Asarum (in particular A. canadense and A. europaeum) shows diuretic and antimicrobic properties and is used as a spice in the kitchen, hence the name of “wild ginger”. It goes without saying that the surprising look of these plants has favoured their cultivation in the gardens of the whole world. It is the case of the Aristolochia gigantea, climber with 20 cm long and 12 cm broad flowers, and of the Aristolochia leuconeura, due to the particular beauty of the white veins on the ample cordate leaves. The family counts now (2015) about 500 species, united in the following genera: Aristolochia, Asarum, Euglypha, Heterotropa, Hexastylis, Pararistolochia, Saruma, Thottea. → To appreciate the biodiversity within the family ARISTOLOCHIACEAE please click here.